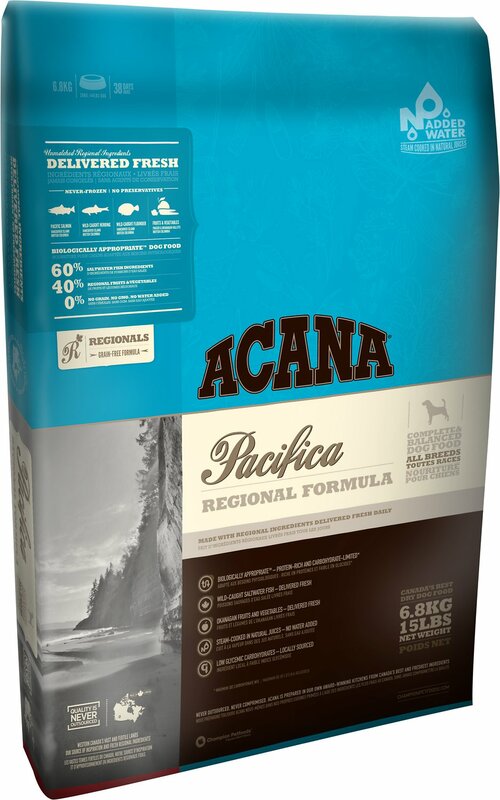 Acana Pacifica dog food is made with the highest quality fresh ingredients including wild-caught flounder, pilchard, cod and herring from North Vancouver island. 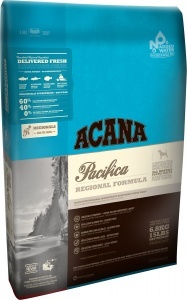 Acana Pacifica dog food is grain-free containing no rice or maize and is easily digested. High in protein and Omega 3 from the 60% fish and natural glucosomine and chondroitin. Acana Pacifica supports healthy skin coat and joints in your dog. Simply the best source of DHA and EPA essential fatty acids The fresh fish in Acana Pacifica are caught off North Vancouver Island packed on ice and delivered fresh (never frozen no preservatives). Acana dog food is one of the best quality foods on sale in the UK today. Acana Pacifica ingredients: Fresh whole pacific herring (14%), fresh whole pacific pilchard (12%), fresh whole arrowtooth flounder (8%), whole herring meal (8%), pacific cod meal (7%), whole whiting meal (7%), whole green peas, whole red lentils, whole chickpeas, whole green lentils, pollock oil (6%), fresh whole silver hake (4%), fresh whole redstripe rockfish (4%), whole pinto beans, whole yellow peas, sun-cured alfalfa, cold-pressed sunflower oil, lentil fiber, dried brown kelp, fresh pumpkin, fresh butternut squash, fresh parsnips, fresh green kale, fresh spinach, fresh mustard greens, fresh turnip greens, fresh carrots, fresh red delicious apples, fresh bartlett pears, freeze-dried cod liver (0.1%), fresh cranberries, fresh blueberries, chicory root, turmeric root, milk thistle, burdock root, lavender, marshmallow root, rosehips. Analysis: Crude protein (min. ): 35 %; Crude fat (min. ): 17 %; Crude ash (max. ): 7 %; Crude fibres (max. ): 6 %; Moisture (max. ): 12 %; Calcium (min. ): 1.3 %; Phosphorus (min. ): 1 %; Omega-6 fatty acids (min. ): 2 %; Omega-3 fatty acids (min. ): 2 %; DHA (min. ): 0.9 %; EPA (min. ): 0.7 %; Glucosamine (min. ): 700 mg/kg; Chondroitin sulfate (min. ): 900 mg/kg. Ultra premium grain-free dog food. 50% Salmon and Trout.